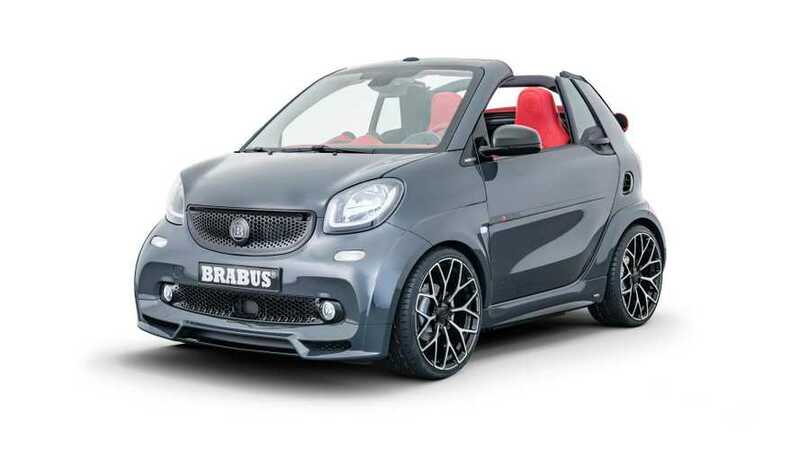 The Brabus Ultimate E Shadow Edition Smart Fortwo Electric Drive Cabriolet debuts bringing a whole lot more luxury to the little droptop at the 2019 Geneva Motor Show, and the famous tuner is only building 28 of them. Brabus imagines the Ultimate E Shadow Edition as a tender vehicle to its 500 Shadow Ops boat, which is also only available a limited run of 28 units. The customized EV costs 64,900 euros ($73,758 at current exchange rates). The Ultimate E Shadow Edition benefits from extra tuning for its electric motor that pushes the output to 91 horsepower (68 kilowatts) instead of the standard 81 hp (60 kW). In addition, torque grows to 133 lb-ft (180 Nm) rather than the usual 118 lb-ft (160 Nm). The extra output allows the little machine to reach 62 miles per hour (100 kilometers per hour) in 10.9 seconds and a top speed of 81 mph (130 kph). The maximum range is 78 miles (125 kilometers) on a charge. A drive mode selector offers four settings. The standard one keeps the power at the level of a stock Fortwo Electric Drive. Eco increases the energy recovery from the regenerative brakes. Sport improves the throttle response, and Sport+ gets the extra power out of the electric motor. Brabus also does extensive work on the Ultimate E Shadow Edition's appearance. The vehicle wears custom gunmetal gray paint. The firm fits a widebody kit that broadens the fenders, and the Fortwo Cabriolet now rides on 18-inch forged wheels with Y-shaped spokes. The revised exterior parts also include a front splitter, more prominent side sills, and a rear diffuser. The interior of the Ultimate E Shadow Edition makes extensive use of crimson leather, including for the seats, door panels, dashboard, steering wheel, and more. Carbon fiber trim adorns the instrument cluster surround, air vent rings, around the clock, and more. Aluminum covers the pedals, shift knob, and parking brake leather. The Brabus 500 Shadow OPS boat is even more powerful than its tender. Two outboard motors offer a total of 493 hp (368 kW), and this lets the watercraft reach a top speed of 50 knots (92.6 kph or 57.5 mph). The world's first performance-tuned electric car meets a high-performance recreational craft in a class of its own. And both come from the same company: BRABUS! The extravagant BRABUS Ultimate E Shadow Edition “1 of 28” celebrates its world premiere at the Geneva Motor Show 2019 as a quasi "tender to" the exclusive BRABUS 500 "Shadow OPS" Limited Edition "1 of 28" recreational craft. Since 2016, BRABUS Marine has been cooperating with Axopar, the Finnish manufacturer of high-performance boats, and at the beginning of the year presented already its second own craft, which will be sold in a limited edition of 28 boats. The agile city sports car that goes with this boat is based on the smart EQ fortwo cabrio and thanks to its electric motor uprated to 68 kW / 92 hp (91 bhp) with four different drive modes it is the first vehicle of its category with motor tuning. Powered by this motor, the refined two-seater sprints from rest to 100 km/h (62 mph) in just 10.9 seconds. The car has a top speed of 130 km/h (81 mph). The dynamic agility of the "pocket rocket" from BRABUS is accompanied by a strikingly styled widebody version with 18-inch forged wheels and a luxurious BRABUS fine leather interior. The design of the BRABUS Ultimate E Shadow Edition “1 of 28” special model drew on the expertise of BRABUS ZERO EMISSION. This business unit of BRABUS Group has been working on alternative powertrains since 2008. BRABUS has been one of the top addresses worldwide for exclusive high-performance automobiles for more than four decades. The BRABUS ZERO EMISSION business unit of the automotive manufacturer recognized by the German Federal Motor Transport Authority is dedicated to the development of cars with alternative powertrains. BRABUS Marine is another division of the Bottrop-based company, which deals with building and refining boats and yachts. In the BRABUS Ultimate E Shadow Edition “1 of 28” city sports car, the two teams pooled their expertise to build a "tender" for the new recreational craft presented by BRABUS Marine early this year – the BRABUS 500 "Shadow OPS“ Limited Edition "1 of 28", whose two outboard motors with a combined output of 368 kW / 500 hp (493 bhp) give it a top speed of more than 50 knots (92.6 km/h/57.5 mph). The compact 28-foot boat is one of the most dynamic of its kind and comes from BRABUS Marine refined with exclusive appointments. To be just as agile on land, BRABUS developed a "tender" for the city, which is not only equally nimble, but also boasts many parallels to its seagoing counterpart with regard to the design. The two-seater, which celebrates its world premiere at the Geneva Motor Show 2019, is painted the same gunmetal gray and in the cockpit features the identical combination of red leather and Silvertex fabric as the BRABUS 500 "Shadow OPS" Limited Edition "1 of 28". However, instead of two eight-cylinder gasoline engines like the boat, the city speedster relies on an electric powertrain: The basis is provided by the smart fortwo EQ cabrio of the current generation, which is powered by a three-phase synchronous motor in the stern. The power is sent to the rear wheels by a single-speed transmission. BRABUS stands for high performance and consequently the development engineers did of course not settle for the stock output of 60 kW / 82 hp (80 bhp). Thus, they developed a performance upgrade for an electric car, making BRABUS the first company in the world to do so. The BRABUS PowerXtra performance upgrade includes a reprogrammed torque control system, special modules for the driving dynamics switch and the accelerator pedal as well as a special gateway. These measures allowed unleashing and using the inherent reserves in this electric powertrain. The "driving fun switch" in the cockpit enables the driver to choose between four different drive modes. In Level 1, the electric motor responds as in any stock smart EQ fortwo. In the "Eco" position, the energy recovery rate is increased and the two-seater brakes much more strongly than the production model when lifting off the accelerator. Level 3 stands for "Sport.” The accelerator pedal delivers quicker response and the energy recovery rate is dialed down to the production level. When the driver selects the "Sport +" mode, the motor produces an increased peak output of 68 kW / 92 hp (91 bhp) and peak torque climbs to 180 Nm (133 lb-ft), a proud 20 Nm (15 lb- ft) more than the production vehicle. This mode also offers more direct accelerator pedal response while the energy recovery rate remains at the production level. In "Sport +" mode, the BRABUS two-seater sprints from rest to 100 km/h (62 mph) in just 10.9 seconds. The top speed remains limited to 130 km/h (81 mph). It goes without saying that the exclusive city sports car remains completely carbon-neutral despite its increased performance. Depending on the driving style, the BRABUS Ultimate E Shadow Edition “1 of 28” has a range of up to 125 kilometers (78 miles) on one battery charge. However, the "tender" city sports car captivates not only with its eco-friendly and at the same time fascinatingly dynamic powertrain: The design of the city sports car also sets itself apart from the crowd! The two-seater is a preeminent eye-catcher not only thanks to its gunmetal gray special paintwork, but also thanks to its thrilling WIDESTAR body, which is exclusively reserved for the vehicles of the limited BRABUS Ultimate special editions. The widebody version has a sporty and dynamic design with fender flares at the front and rear axle. They create space for 18-inch wheels with low-profile tires, which are highly unusual for an electric car of this size. Hi-tech forging technology is used to produce especially lightweight BRABUS Monoblock Y forged wheels for the current supercars based on the latest smart generation. With the front wheel weighing just 6.7 kilograms (14.7 pounds) and the rear wheel just 7.1 kilograms (15.6 pounds), the BRABUS Monoblock Y wheels for the BRABUS Ultimate E Shadow Edition “1 of 28” are among the lightest 18-inch wheels on the market worldwide. A crucial factor in the lightweight construction is the delicate design featuring nine spokes with polished surfaces, which taper off into the outer rim of the wheel in the shape of a "Y." Thanks to the widebody version, the front axle can be fitted with size 7Jx18 wheels and size 205/35 R 18 high-performance tires. On the rear axle, size 235/30 R 18 tires on eight-inch rims provide optimal traction and agile handling. The BRABUS suspension was specifically calibrated to the weight of the electric car, the ultra-low-profile tires and the wider track. It combines sporty and safe handling with the desired ride quality. Of course, the widebody comprises not only wider fenders, but also aerodynamic- enhancement components such as front spoiler, rocker panels and rear diffuser, all developed in the wind tunnel. The cockpit of the BRABUS Ultimate E Shadow Edition “1 of 28” is a prime example of an outstanding combination of fascinating design, masterful workmanship and meticulous material selection as well. The company upholstery shop created a BRABUS fine leather interior in a combination of especially soft and breathable BRABUS Mastik leather and Silvertex fabric for the seat surfaces. The red is exactly the same that also adorns the seats and lounger area of the boat. This color is found not only on the seats, the inner sections of the door panels and the steering wheel rim, but also on the dashboard. The lovingly finished details of this exclusive all-leather interior also include square quilting of the seat surfaces applied with pinpoint precision. For a markedly sporty contrast, the BRABUS interior designers created naked-carbon components for the instrument cluster bezel, the air vent rings and the gage holding a charging indicator and clock mounted on top of the left side of the dashboard. The BRABUS aluminum pedals, shift knob and parking brake lever add another touch of racing looks to the interior. In addition, this electric supercar is equipped with tailor-made scuff plates with backlit BRABUS logo, which like the emblem on the stainless-steel footrest in the driver's footwell changes color from white to red. High-quality black floor mats with square quilting and red BRABUS logo complete the classy ambiance. Of course, the BRABUS Ultimate E Shadow Edition “1 of 28” also comes with such elementary comfort features as climate control, sound and navigation system. The "1 of 28" badge on the dashboard documents the affiliation with this exclusive limited edition. Prices for the BRABUS Ultimate E Shadow Edition “1 of 28” start at 64,900 euros MSRP (price includes 19 percent VAT in Germany).